In new report, the Jewish population stats in Judea and Samaria are broken down into towns and regions, detail growth since Dec. 31, 2010. The annual statistics on the precise number of Jewish residents of Judea and Samaria (AKA the West Bank) have been released by former Knesset Member Yaakov "Ketzaleh" Katz. Based on the Population Registry of Israel's Interior Ministry, there are 406,302 Jews in Judea and Samaria as of December 31, 2015. As clearly stated in the report, the statistics do not include eastern neighborhoods of Jerusalem (e.g. Pisgat Zeev, Ramat Shlomo, Ramot, Gilo, Ramat Eshkol, etc.) which are technically part of the West Bank and are home to another approximately 360,000 Jews. In the special English report released today, the Jewish population stats of Judea and Samaria are broken down into individual towns and regions and show the growth over the last year and 5 years. 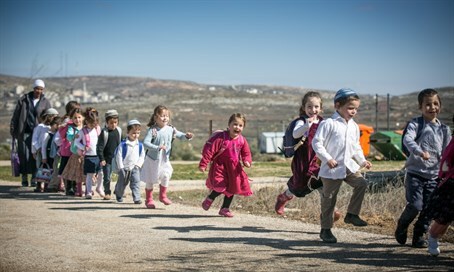 Since December 31, 2010, the number of Jews in Judea and Samaria has increased by 23.95%. The English Jewish Population Stats Report for Judea and Samaria is available for free download via the Israel Cadet Trek site (IsraelCadetTrek dot com) of the Bet El pre-IDF Preparatory Academy. Click here to sign up to the email news list and receive the link to the free report. "The title of my speech, however, doesn’t sound very encouraging or optimistic, but having served for seven years as the UN’s Peace Envoy in Jerusalem I am afraid that I cannot but warn that the Two State Solution is slipping away and that, instead, Israelis and Palestinians are heading towards what I have described as a 'One State reality'." "[Construction in settlements] has fundamentally, and should we add irreversibly, changed realities on the ground with more than 500000 settlers [sic. including the Jews of eastern Jerusalem, the number is closer to 800,000] living nowadays across the 67-lines in what is for them “Judea and Samaria”—the heartland of previous ancient Jewish kingdoms. "Back home in Ramallah, Mr. Abbas’s own son has been telling him that last chance is already long gone, the negotiations futile. The son, Tareq Abbas, a businessman who has long shied away from politics and spotlights, is part of a swelling cadre of prominent Palestinians advocating instead the creation of a single state stretching from the Jordan River to the Mediterranean Sea in which Jews and Arabs would all be citizens with equal rights. "...President Abbas, in a separate interview last month, said Israel’s continued construction in West Bank settlements made it impossible to convince [his son] Tareq that the two-state solution was still viable." The article later quotes Tareq Abbas as saying, "Oh, my father, where is your state? I wander everywhere [in the West Bank] and I see [Jewish] blocks everywhere, I see houses everywhere." "[In reference to the settlement movement] "I always convinced myself that what was being done can and will be reversed, and that the long-awaited awakening would surely come. Now it's too late. [In response to Meron Benvinisti who wrote 25 years ago that the settlements are irreversible] "I wrote then, 'There's no such thing as irreversible. Only death is irreversible.' He was right. I was blinded and continued to operate on mistaken assumptions... I based my false hopes on common sense... on our ability to stop at any moment and change direction. I was wrong. It's my fault. The English Jewish Population Stats Report for Judea and Samaria are available for download after joining the email list. Those who are interested in helping provide scholarships for IDF Cadets from disadvantaged homes are called upon to sponsor a rider in the annual Bike Trek.